There are two distinct cuts and all cuts inbetween the two. 'A-grain' or also known as a Tangent cut. This cut of balsa has a long grain, smooth creamy apperance and is very flexible but lacks stiffness. 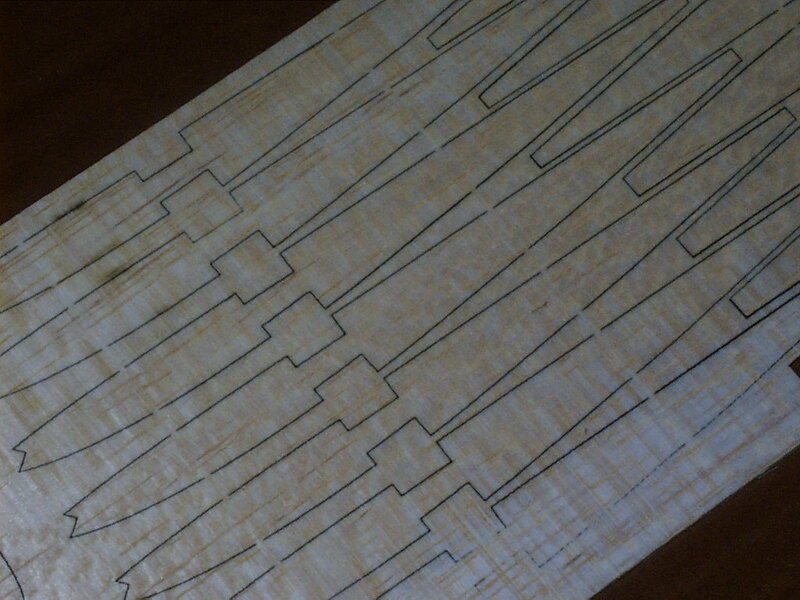 This cut is called a tangent cut because the sheets of balsa are sliced off at tangents to the growth rings. Ideal for: sheet covering on curved fuselages. Wing leading edges (D-boxing etc). forming tubes (motor holders) and flexible spars. 'C-grain' also known as a Quarter grain. This cut of balsa has shorter grains, mottled in appearance (typically) it is quite stiff but subsequently brittle and prone to splitting along the length of the sheet. 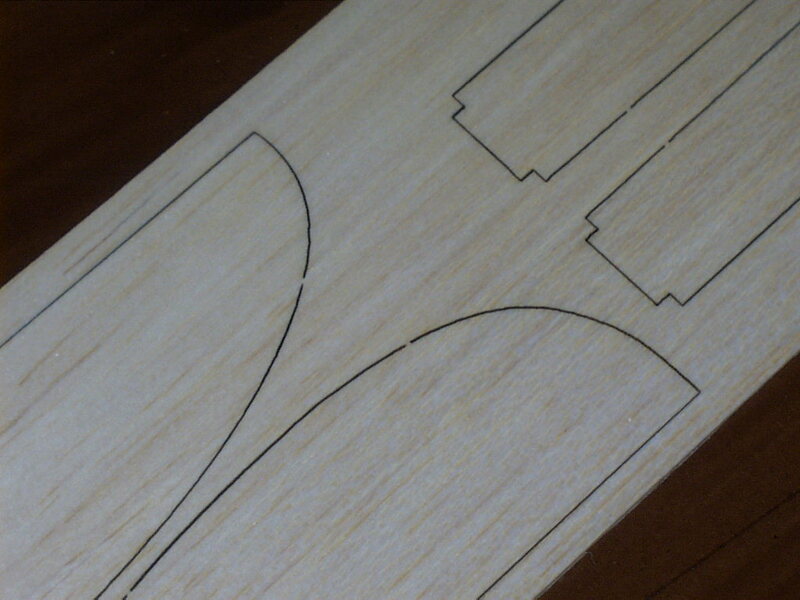 The sheets of balsa are cut at a perpendicular angle to the growth rings. Of all the cuts this is regarded as the most asthetically beautiful. Ideal for: Sheet balsa wings and tails, flat fuselage sides, wing ribs, fuselage formers, and wing trailing edges. 'B-grain' also know as Random or Mixed grain cut. These sheets vary a lot in properties, often a single sheet will vary from A to C grain across its width. If possible, avoid buying sheets that change grain type across the surface, ie they appear to be C grain on one side and A on the other edge these will cause warping issues. You will find that most LHS stock tends to be in the 'B-grain' catagory simply because from a given tree there is only going to be a limited number of quality A and C selections. This cut of wood is useful as a general purpose selection, if you don't have specifically a Tangent or Quarter grain stock selection to use for the job at hand, then the random cut will suffice. Balsa, like all woods can vary in density, or "mass per volume". The denser a piece of balsa, the more it will weigh. The relationship between weight and strength is not always consistent so don't assume that heavier = stronger. 120~200kg/m.cu 8~12lb/ft.cu Common grade balsa, widely available, cheap. This density of balsa is what most model kits are made of. Balsa is supplied precut into an array of thicknesses. Kits and plans will nearly always specify what thickness to use (and sometimes what grain). Common thicknesses are 0.8mm (1/32"), 1.5mm (1/16"), 2.4mm (3/32"), 3.2mm (1/8"), 4.8mm (3/16"), 6.4mm (1/4") and 12mm (1/2"). Because both imperial and metric thicknesses are generated based on where the balsa is cut, you may find there are minor differences in the thickness availability. There is no problem if the plan calls for 3/16" and you can only obtain 5mm, these are small differences and will usually be sanded off later. Typically balsa is sold in 914mm (36") and 1000mm (40") lengths. Longer sheets can be obtained on special request from the cutting factory. The two most common widths are 75mm (3") and 100mm (4"). The wider the sheet the more expensive the balsa becomes, this is because a wider sheet requires a larger tree to be cut reliably. If you try to obtain a wider sheet from a tree that is too small/young it will be poor quality due to the grain excessively changing across the width. Expect to pay a premium for good quality wide sheets.